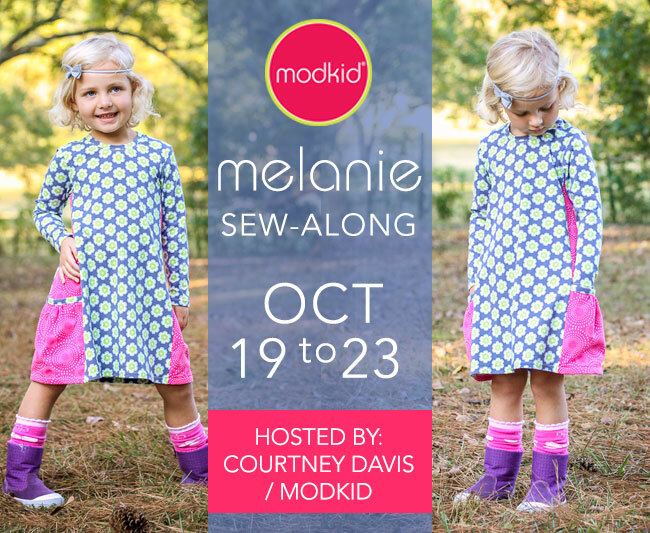 The sew-along will be October 19th-23rd. So put it on your calendar now! Between now and then we’ll be posting what you’ll need, the schedule, and prizes. During the sew-along we’ll tackle a few steps each day to take you through the pattern. The Modkid Melanie is a comfy knit dress with 3 sleeve lengths to suit any season. There will be a participation prize and a Halloween related prize. Stay tuned for prize details! You’ll want to post your finished dress by Monday, October 26th to be entered to win one of the prizes. Post your photos to the Modkid Fan Group page. Also, post dress photos to Facebook and Instagram using the tag #melaniesewalong so we can all find you. Want more good news!?! Coupon code MELSAL2015 gets you 30% off your entire order in the Modkid Etsy store. That’s ANYTHING you buy in the shop not just the Melanie pattern!! The coupon code expires on Monday, October 19th at midnight EST. You might want to grab the Melanie Misses while you are at it!